The Obama Administration’s Young African Leaders Initiative (YALI) is a signature effort to invest in the next generation of African leaders. Nearly one in three Africans are between the ages of 10 and 24, and approximately 60 percent of Africa’s total population is below the age of 35. President Obama launched YALI in 2010 to support young African leaders as they spur growth and prosperity, strengthen democratic governance, and enhance peace and security across Africa. 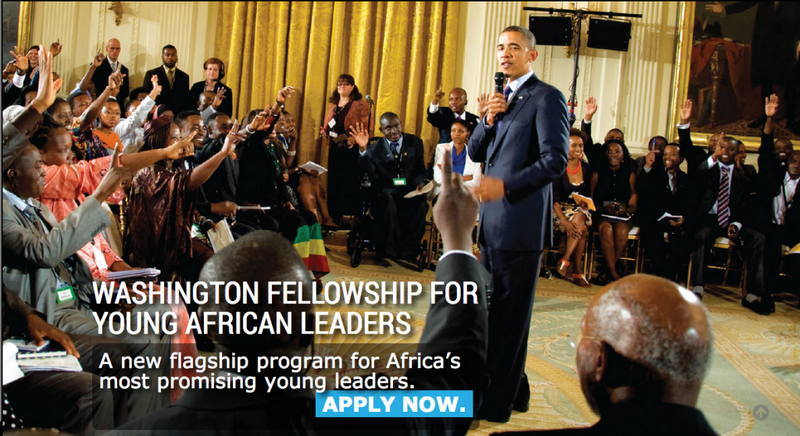 The Washington Fellowship for Young African Leaders is the new flagship program of President Obama’s Young African Leaders Initiative (YALI). This new program was first announced back in July 2013. Are citizens and residents of one of the countries listed below. A 6-week Academic and Leadership Institute: Fellows are placed at U.S. colleges and universities for academic institutes. Institutes will focus on skills development in one of three areas: Business and Entrepreneurship, Civic Leadership, or Public Management. Institutes will take place from mid-June to late July 2014. A Summit with President Obama in Washington, DC: At the conclusion of the academic and leadership institute, all Fellows will participate in a Presidential Summit. The Summit will take place in late July 2014. An optional 8-week U.S. Internship: As part of the Fellowship application, individuals may apply to receive practical training at a U.S. business, civil society organization, or public agency in the United States. Approximately 100 Washington Fellows will be selected for U.S.-based internships. The U.S. internships will take place in August and September 2014. Activities in Africa: Fellows will have the opportunity for continued networking opportunities, ongoing professional development, access to seed funding, and community service activities upon their return home after the Fellowship. Five hundred (500) positions will be awarded EVERY YEAR. Within the next five years, the initiative aims to grow to 1000 young leaders each year. Washington Fellows will spend six (6) weeks at top American universities and colleges for tailored training in the areas mentioned above, and another optional eight (8) weeks Internship period to receive practical training. A potential eight-week internship at the conclusion of the academic and leadership institute (optional, and competitive for approximately 100 slots). To prepare and submit your application for the Washington Fellowship for Young African Leaders, applicants must visit the IREX Online Application System. All applications must be submitted via the online application system. The application instructions(pdf) provide detailed information regarding the financial provisions of the fellowship, eligibility and selection criteria for the program, and details on applying. Please read the application instructions carefully prior to beginning the application. It is recommended that you print these instructions and refer to them while completing the application. It is very important to visit the official website (link to it is below) for details. Completed applications, including all supporting documents, are due by 12:00 midnight Eastern Standard Time, January 27, 2014. The trainings aim to leverage top faculty, cutting-edge curricula, and local opportunities to impart practical professional and leadership training to young Africans. Read more from the initial announcement of the Washington Fellowship Program. is it an annual scholarship?